Students construct a geologic map of a region of Venus' surface using NASA Magellan synthetic aperture radar(SAR) data (provided) and/or synthetic stereo data (provided, and constructed using Magellan SAR and altimetry data)- 3D anaglyph viewed through red-blue glasses. Mapping can be done digitally using Adobe Illustrator (or a similar graphic program) or using hard copy images and overhead transparencies for mapping. Students construct a complete geologic map, determine a geologic history for the area, and propose hypotheses for the evolution of a large quasi-circular geomorphic/geologic feature that occurs within the map area. Students also propose tests of their hypotheses (whether such tests can be accomplished through further mapping, future missions, experiments, theoretical arguments, calculations, etc.). Students must clearly identify assumptions they make in their hypotheses/models. 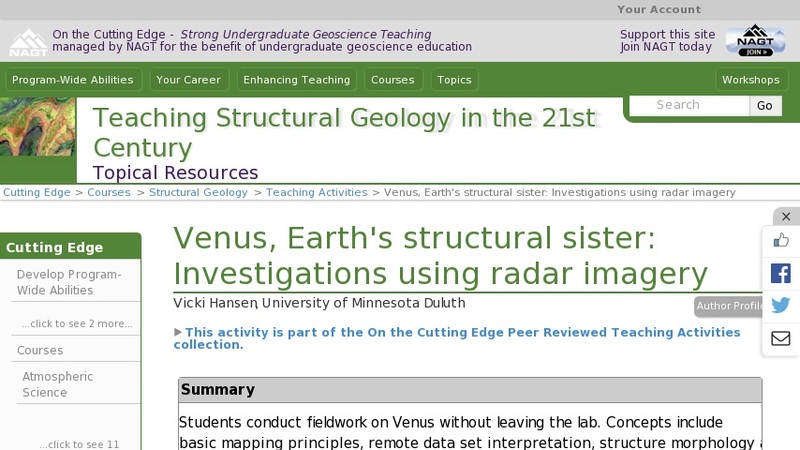 Individual, or small group, write-ups and completed geologic maps summarize student analysis. This activity connects structural geology to other fields, and provides the students with an opportunity to experience geologic investigation in which there is no single right answer, but there are "wrong" or unlikely hypotheses. This exercise helps students think outside the box with little fear given that they are dealing with - literally - an extraterrestrial world in which very little is known - and yet, we assume that chemistry and physics, as we know them, likely operated on Earth's sister planet. Students are given a short introductory presentation about the environmental conditions of Venus (which could have been different in the past), and an introduction to radar data before they begin.